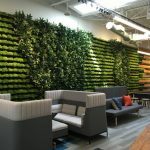 From West Elm’s foray into workplace to VR space planning (and all of the height-adjustable desks in between), here’s a peek at what caught our eye earlier this week in Chicago. Click through each image for more information about the products, and join us for our next webinar on June 30 for a closer look at NeoCon 2015 with furniture industry observer and commentator, John Sacks. A range of new fabrics at KnollTextiles. The “catwalk” at Herman Miller. A nice counter height solution at HBF. A light installation in Kimball’s showroom. West Elm introduced their workspace collection. Inspiration from Philip Low’s prismatic sculptures at Designtex. David Adjaye debuts his collection with Dorothy Cosona’s for KnollTextiles. The Love Seat by PearsonLloyd for Teknion. Thos. Moser’s first task chair. The Distil Desk by Todd Bracher for Herman Miller. Fun with stamps at Kimball. Cork fabric by Erin Ruby for HBF. Horsepower – Knoll’s recharging solution. You can run wires through the base of Allsteel’s new wall panels. Sven Govaars and Dean Strombom’s seminar. Philip Low’s prismatic sculptures at Designtex. Trying the VR space planning tool at CET. “Desert Moon” – one of Designtex’s Made to Measure wallcoverings. A forest of power with Knoll’s Interpole. Always love all of the colors at 3form. The HighLow BuzziPicNic at BuzziSpace. All photos by Natalie Grasso.